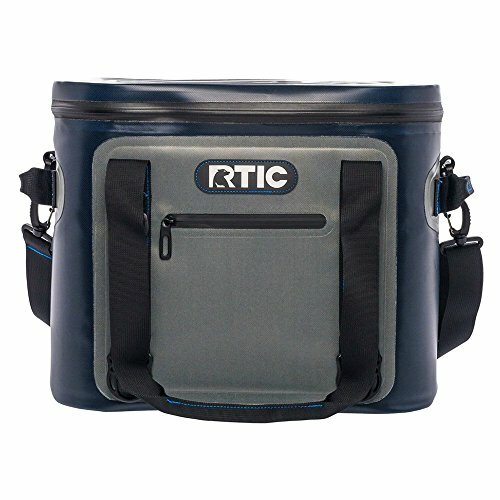 RTIC Soft Pack 30 - Blue / Grey by RTIC at Just Gathering. Hurry! Limited time offer. Offer valid only while supplies last. Our midsize cooler makes a perfect multipurpose cooler. It is 100% leakproof, puncture-resistant, and has an antimicrobial liner that resists mildew. View More In Kitchen & Dining. Our midsize cooler makes a perfect multipurpose cooler. It is 100% leakproof, puncture-resistant, and has an antimicrobial liner that resists mildew. It is tough as nails and keeps ice for up to 5 days. Holds up to 30 cans of your favorite beverage plus ice. Wrapped in a heavy duty vinyl shell, it is stronger than any other soft-sided cooler, tear resistant and UV protected to ensure it does not fade. With up to 2 inches closed-cell foam insulation, this cooler keeps your drinks frosty cold. Use the exterior pocket for dry items. Holds up to 30 Cans Plus Ice. Up to 2" of Foam Insulation. Lightweight & Durable - Made with Tough, laminated fabric and welded seams. If you have any questions about this product by RTIC, contact us by completing and submitting the form below. If you are looking for a specif part number, please include it with your message. © 2019 - justgathering.com. All Rights Reserved.